The picture shows the Natural pearlized inner shell of the Tiger Nautilus. 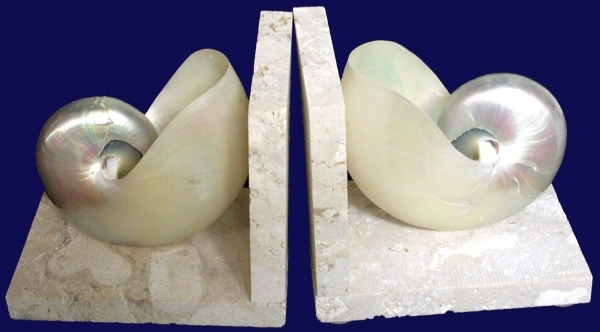 The bi and tri cut Nautilus shells are the best way to view the iridescent inner shell of the Natural Nautilus. The picture shows the compartments of the Nautilus. This is where the Nautilus animal housed itself while the shell grew. Each compartment represents a growth period. You can also see the Nautilus beak. The beak is different for every Nautilus. Notice the black coloration, this is the beak, where the animal lived. The color comes from a dye the animal releases. 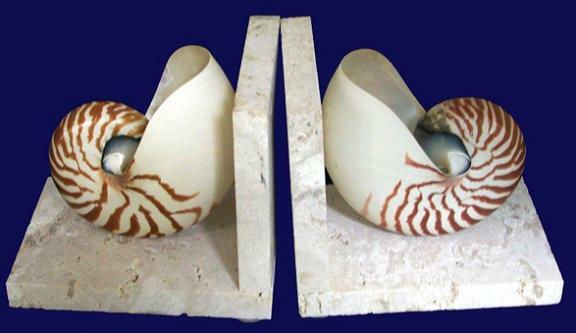 THREE SECTION TIGER NAUTILUS SHELL MATCHING SET. 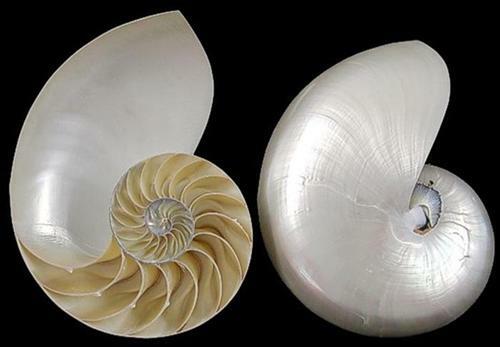 ***Our Nautilus shells are in their natural condition. We carefully inspect shells to make sure they are not broken before Shipment. These are high quality shells. These are actually a highly polished Tiger Nautilus shell. Artisans polish the Tiger Nautilus shell down to its iridescent inner shell or nacre; often called the "mother of pearl". Notice that the Tiger Nautilus is pearlized with the exception of the beak. As previously described, the beak is unique in all Nautilus shells. The beak is the area of black coloration near the shell opening. It is where the animal lived. While alive, the Nautilus animal excreted a black dye like liquid. 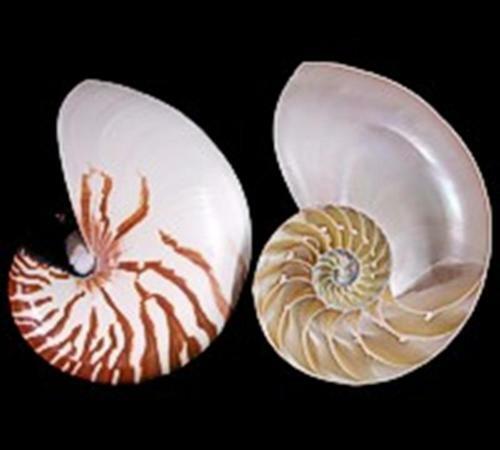 Tiger (natural Nautilus) shells are found mostly in the Indochina waters, running from the Indian Ocean East to the northern coast of Australia. 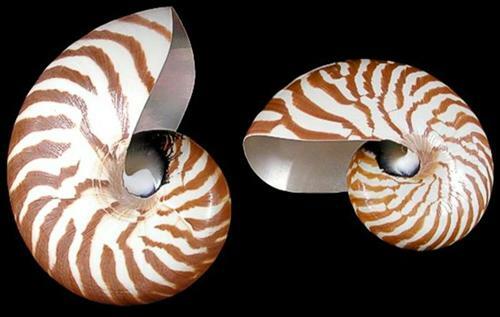 They are free swimmers; using their chambered inner shell areas to hold a gas that keeps their buoyancy under conThe Pearl Nautilus shell is the Natural Nautilus or sometimes called the Chambered Nautilus or Tiger Nautilus. The Pearl Nautilus under goes intensive polishing until the inner shell or nacre appears. 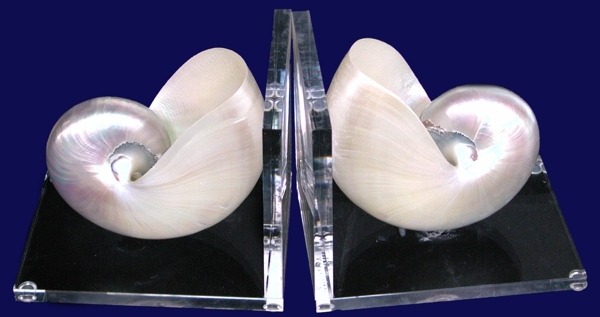 The nacre sometimes referred to as the "mother of pearl". You can see the pearlized effect in the picture. The Tiger Nautilus has this pearlization on the inner side of the shell. The Center Cut Pearl Nautilus enables you to see the Nautilus chambers (where the animal lived during stages of its life). The chambers were gas filled, which helped the Nautilus control its buoyancy. The buoyant shell then was able swim freely with the ocean currents. This is a lightweight thin-shelled species, coveted for its color. The pearlized Nautilus is especially sought by collectors and vacationers for its total pearlized look. 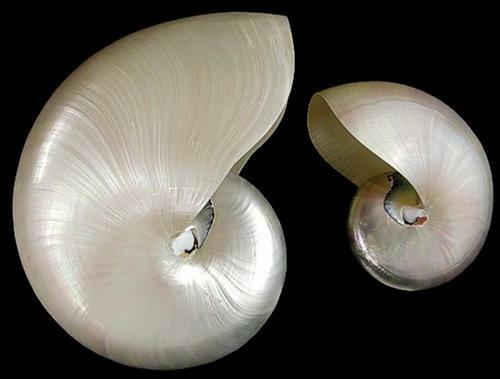 The Pearl Nautilus shell has the pearl effect over its entire body except for the beak. The beak is unique with all Nautilus shells. You will see the beak at the shell opening. The picture does not give a good example of the beak. The is composed of black discoloration. It is where the Nautilus animal last lived inside the shell (the final chamber). The beak color is from black/purple like dye the animal excretes. The beak is more pronounced in some Nautilus'. The Nautilus is now mostly confined to the Indo-Pacific region. Our Book End Pairs are all hand crafted. Each Pair is unique. Our Shell Book ends are all individually hand crafted. The shells set on a dense coquina rock base. 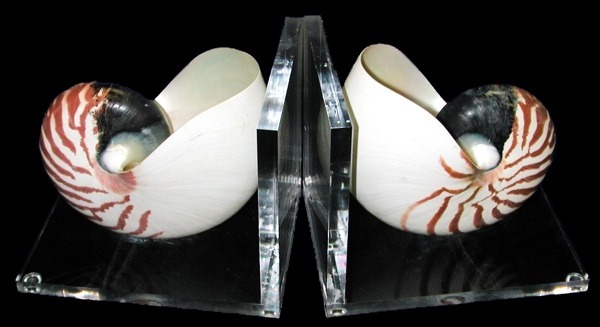 The Tiger Nautilus Book End Pairs are all individually hand crafted. They rest on a Coquina Rock Base.